Under a partnership with the UPHCA, our online courses are approved to help meet the continuing education requirement for all Plumbing, HVAC, and Water Softener contractors in the State of Utah. They will not meet the requirement for General contractors. 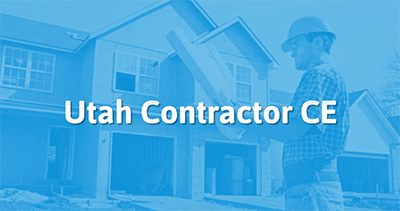 What Are The Education Requirements for Utah Contractors? In the state of Utah, licensed contractors are required to obtain 6 hours of continuing education every two years. 3 hours must be 'core' classes, and the other 3 can be Core or Professional courses. Additionally, only 3 hours of a contractor's continuing education can be done in an online format. The remaining 3 of your 6 hours must come from a live classroom format course. This 3 hour core continuing education course is focused on OSHA safety standards and overall job-site safety. This course is intended for contractors and plumbers. Note: Only Plumbing, HVAC, & Soft Water Contractors can receive credit for completing this course. This 3hour course of continuing education training is designed for contractors and plumbers in Utah. The course will explore some of the significant changes that were made to the IPC. Specifically, this class will discuss the regulations affecting water heaters, water supply, and nonpotable water systems. Note: Only Plumbing, HVAC, & Soft Water Contractors can receive credit for this course. This is a 3 hour course that is built to provide contractors and plumbers in the Utah with core continuing education training. Note: Plumbing, HVAC, & Soft Water Contractors are the only types of contractors who can receive credit for this course. This course is 3 hours long and provides Utah contractors and plumbers with core continuing education content. Only Plumbing, HVAC, & Soft Water Contractors will receive credit for taking this course. The 3 hours of continuing education content contained in this course are intended for plumbers and plumbing, HVAC, & soft water contractors in Utah. This course discusses the changes that were made to the first 5 chapters of the IMC. This 3 hour course on changes to the IMC has been approved to provide credit to plumbers and contractors who complete it. Note: Only contractors who specialize in Plumbing, HVAC, and Soft Water will be able to receive credit for this course.